Henry David Thoreau (July 12, 1817– May 6, 1862) was an American author, naturalist and philosopher. His friend, Ralph Waldo Emerson had a great impact on him, and supported him in many ways. Emerson provided a place for Thoreau to live at Walden Pond, which inspired his book, Walden. He is best known for his book Walden, a reflection upon simple living in natural surroundings, and his essay, Civil Disobedience, an argument for individual resistance to civil government in moral opposition to an unjust state. Thoreau was born on July 12, 1817 in Concord, Massachusetts. He spent his childhood with his three brothers and sisters: John, Helen, and younger sister Sophia. His father owned a local pencil factory, and his mother rented out parts of the family home to boarders - people who come from other places. Thoreau received his education at the public school in Concord, the private Concord Academy, and graduated from Harvard College. One day in the summer of 1841, Henry David Thoreau was worried about money after leaving his job at his father's pencil factory. Suddenly, the most famous writer at the time, Ralph Waldo Emerson, knocked on his door. Emerson asked him to work as a live-in handyman at his house. During the days he lived with Emerson, Thoreau began to have dreams of becoming a writer. 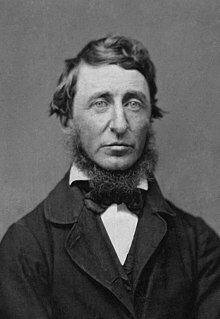 As the government needed money for the Mexican-American War, Henry David Thoreau refused to pay a direct tax for the war. Therefore, his started to protest against the government. He thought war was a bad thing, so it was necessary to resist government. That led to him being put into jail. Although people gave him advice to pay the tax, he still didn't pay it. He didn't fear the government and at the same time inspired other people to join this protest. The night in the jail allowed him to start writing his essay, Civil Disobedience, In the notes, he talked about the thought process of active, stated refusal of a citizen to obey certain laws or demands, orders of the state, and commands of a government. After twenty years, the notes were printed into a book by the same name, and read by many people, including Martin Luther King Jr.
On May 6, 1862, Thoreau died of tuberculosis, a disease, which had been affecting him for many years. After he died, he left behind many unfinished notes. Some of them were later printed. When Thoreau died, Ralph Waldo Emerson said of him in his funeral speech: "The country knows not yet, or in the least part, how great a son it has lost.... His soul was made for the noblest society; he had in a short life exhausted the capabilities of this world; wherever there is knowledge, wherever there is virtue, wherever there is beauty, he will find a home." He was first buried in the Dunbar family plot at Sleepy Hollow Cemetery in Concord, Massachusetts. However, in 1870, his grave was moved to Author's Ridge towards the back of the cemetery to be closer to the graves of his writer friends Emerson, Alcott, Hawthorne, and Channing. Walden was printed in 1854, and it seemed to be one of the most well-liked books during that time. The book is about his stay in the woods by a pond in 1845 for two years, two months, two weeks, and two days. During this time, he learned many things like how to get in touch with nature and spend time with himself. The books, The Maine Woods, A Week on the Concord, and Merrimack Rivers also supported these ideas of trying to have a more natural and non-material life-style. ↑ Biography of Henry David Thoreau, American Poems (2000-2007 Gunnar Bengtsson). ↑ 2.0 2.1 "Henry David Thoreau Biography". ↑ 3.0 3.1 "Life and Legacy | The Thoreau Society". www.thoreausociety.org. Retrieved 2018-05-23. ↑ McElroy, Wendy (2005). "Henry Thoreau and 'Civil Disobedience'". The Thoreau Reader. Iowa State University. Retrieved 10 June 2016. ↑ 5.0 5.1 "Henry David Thoreau – The Walden Woods Project". The Walden Woods Project. Retrieved 2018-05-23. ↑ "Meet Thoreau: Henry's Global Impact". World Wide Waldens.org. The Walden Woods Project. 2011. Retrieved 10 June 2016.